Registration is $10 and is open to all. Judging is participant judged. This is a nice cruise-in that occurs the 2nd Saturday of each month, good food, people and music. Trophies awarded for the winners in each class, plus great door prizes, and a 50/50 drawing! is this still going on this month? I'm not sure. I've heard that last month was the last one, but I don't have any confirmation. I talked to Gary and he said the September show was the last of the year. But you might want to call Cafe 302 and make sure they didn't decide to do it one more time this year. If Gary said September was the last one, then it's done for the year. I'll revise the listing for next year. anybody know the classes for this? i was trying to figure out what car to bring. working on trying to get both out but not sure if thats gonna happen. Also how much is it to enter. This event primarily caters to older cars. I believe it is $10 or $15 to enter and they always have a lot of door prizes. Just trying to decide if I wanted to go to this or the one in Gurley. I'm trying to get the CRX in front of some people this weekend and get it sold. Gurley is an actual car show versus Cafe 302, which is a cruise-in. But what's interesting is that Gurley used to have a cruise-in at the same location and same time years ago that was really great. Since the Gurley event is one-time and Cafe 302 is going to be around next month, I'm planning on the Gurley event. But I haven't seen what all is going on this weekend, so this might change. Last edited by Samir; May 6th at 07:54 AM. June 12th is the 2nd Saturday, is this cruise-in still taking place? Yes, this event is still taking place. 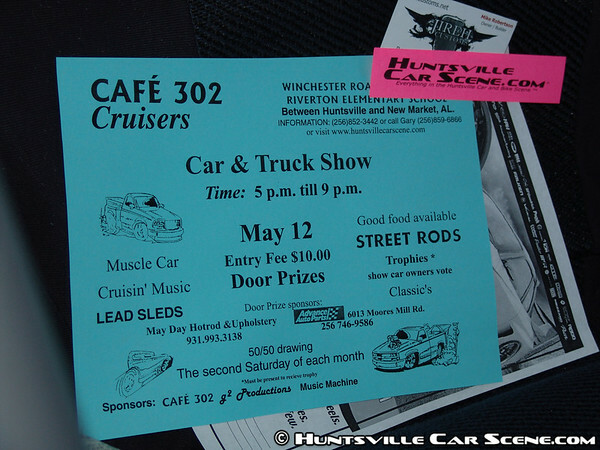 In fact, this event is so long standing that it was the first cruise-in I ever attended back in the early part of the decade. And it's still going strong after all these years. I'm glad to know that its still going on! I never see flyers for it anymore, or anything. We'll most likely head out that way this weekend! I'm cool, I won a trophy last month......ok so there was only like 3 cars in my class and it was top 3......still won my first throphy since i was 17, kinda suprised me. Your car is very clean, so that wasn't too surprising to me. 302's judging is a bit different than most local events, making for a different experience for participants. I think it's one of the attributes that has contributed to this event's long-term success. got the lude back so ill be here and hcru show!!! Here's a few more from the show. It was nice walking away with a trophy after the G8's first showing. Aww man! I can't believe I missed that. Congrats! I had a wedding reception to go to.